While browsing Amazon, I came across appalling 1992 "comedy" Stop! Or My Mom Will Shoot, and was abruptly stopped in my tracks by the average star rating allotted by Amazon reviewers. 4.5 stars...bear in mind that's 4.5 out of 5... 20 reviewers. What in god's name is happening?! I couldn't resist reading them to find out what exactly people loved about this notorious train-wreck. Rather than howls of 'so-bad-it's-good' I was greeted by numerous reviews attesting to how funny the film is, and dismay at the movie's negative critical reception. Each contained at least one grammatical mistake, and none of the reviews led me to reconsider my position on Stop! Or My Mom Will Shoot. However, special mention goes to Mr M.E.B. Woods, who has written one of the most bizarre reviews I have encountered on Amazon. I have reposted the review in full below, as it is well worth a read. This film is so funny I almost lost the plot. 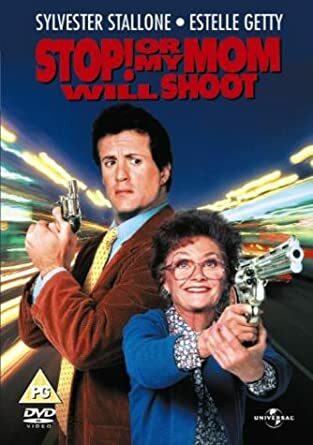 'Mom' is so old you have to laugh at her and slyvester Stalone can really act. I think the film is supposed to show you how annoying parents are and how you should distance yourself from them as quickly as you can - fairplay. I can't remember the plot totally because I wasn't listening but I think 'Mom' turns up at stalone's place because she thinks he should be married and settling down. Why she cares God knows. She's not actually stalone's 'mom'. I saw stalone's mum on Big Brother, now she is a real horror. Twice as worse as the one in this movie. So I suppose it's a biopic. 'Mom' precedes to hilariously get on Sly's nerves and screw up his life. By the end of this maternal overload stalone almost has a breakdown. Brilliant. Theres an awesome set piece, where the clueless old bag trys to wash out stalone's hand canon in the sink. Jeeze what a dummy. You can't clean a gun with washing up liquid - eveyone knows that. There's another funny bit where Sly is in a fire fight in a nappy. I can't quite remember why, but his mum was there and she was meddling as usual. Silly Cow. Actually I know how stalone feels. 'Mom' got on my nerves something chronic too. I wish she wasn't in the movie. I don't think her input was necessary. Yeah, sure she gets the laughs, but I can't honestly say she helped catch the bad guys . At one point Mom had the opportunity to blast some baddie in the face with a six shooter. Instead she just had a chat with him. I mean seriously, waste the guy. Sly would. Way to ruin my enjoyment 'Mom'. Doing stuff like that just makes the film miserable for eveyone. I was pretty upset with her. Stupid women. If I was director I would axe mum and just call the film "Stop or I'll Shoot". Hey, it works already. I would also axe Stalone's girlfriend, she is crap. They're not suited to each other and she's boring. Basically she's not good enough for him. To be honest she's a minger and should go away. He should be doing it with Angelina Jolie and J-Lo. It's a bit tight but I would also replace Slyvester. I think someone like Steven Siegal would play the part better and he moves faster and has a deep understanding of native american beliefs and all forms of hand to hand combat. Actually I only watched the film cos my mate said Steven Siegal was in this film - he's not. I find that sort of deception abhorent and unforgivable and we are no longer friends (it's not the first time it's happened either). However, personally I think that 'Mom' isn't the worst mum in the world. She buys sly an uzi as a bday present for gods Sake. YES! YES! YES!. If my mum bought me an uzi she could come round and do the washing up\laundry every day of the week (hang about, she already does). You know Sly should give that woman a break. I don't know why he has to be such a jerk wad. Anyone else would just explain to their mum, that they needed some space. Stalone thinks he's hard cos he plays a cop who doesn't play by the rules. Big deal. Bruce Willis and Mel Gibson didn't played even less by the rules better. Stalone makes a rubbish cop. No proper cop would allow his mother to interfer with his duties. He should be stripped of his badge and go back to boxing. 4 stars out of 5. Dropped one because of 'Moms' went easy on the baddie.